Tim Keller is the pastor of Redeemer Presbyterian (PCA) Church in New York City. This is Keller’s 15th book, three of which have been on the New York Times bestseller list. Keller’s book looks at the three levels of ministering the Word. Level 1 is the informal teaching and counseling of the Word which is the responsibility of all Christians. Level 2 includes greater analyses and might include writing, blogging, teaching, moderating and mentoring. 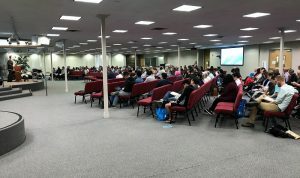 Level 3 involves the preaching of sermons. Keller’s book seeks to be a resource at all three levels, but focuses heavily on levels 2 and 3. Keller is known for engaging the culture. He stresses that contextualization of Scripture is not the same as accommodation of sin. The message must be understandable to the listener so they can comprehend the truth and see where they fall short. The same God honoring message might be taught differently based on the socio-economic, historical, geographic or language variations between audiences. Contextualization must never alter or sacrifice biblical truths. One might ask how to teach the story of the woman at the well to a culture that has never seen a well. Is it most important to focus on the compassion of Christ or the structure that helps hydrate a community? Preaching is not simply the explanation of the text at hand, but utilizing the text to engage the listeners. The hearers must be engaged without altering or sacrificing Scripture. When a preacher or teacher expounds Scripture they must demonstrate how only Christ can save us. Jesus must be the end result of every Sunday school class or sermon. Preachers of the gospel must show in their words they remember the emptiness of a life without Christ. A preacher must allow the listeners to hear in his voice that he is, even after decades, amazed and grateful of the grace and mercy Jesus has shown him. The preacher must engage the culture, but not be a slave to it. Hip cultural references in sermons run the risk of the preacher pointing to his own knowledge and relevance instead of the timeless truths in Scripture. The purpose of understanding the audience and their culture is to show how Christ differs from those things that have enslaved man. 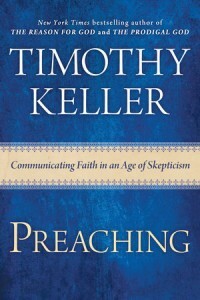 Keller stresses that good preaching is the work of the Holy Spirit and not the preacher. The preacher must stick to the infallible Word of God, prayer and truth. Preaching is a privilege and should be treated as such. This is a wonderful book for all levels. Admittedly, it is more appropriate for teachers and preachers, but offers much for all. Keller brings to this book the experience of preaching for decades and thorough biblical exegesis to help the reader see what our Father commands of those who share the gospel with others.